Red is the co-transcriptional activator Yap in its phosphorylated form. Cyan is the Trophectoderm marker Cdx2. Grey is the actin cytoskeleton. Animals come in all shapes and sizes. We want to understand how the mammalian embryo is built. 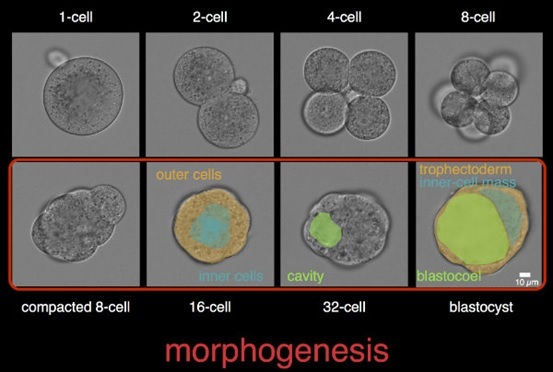 For this, we study how the forces that deform and move the cells within the embryo are produced. Usual suspects are adhesion molecules, gluing cells together, and the cytoskeleton, which can push and pull on these adhesion molecules. 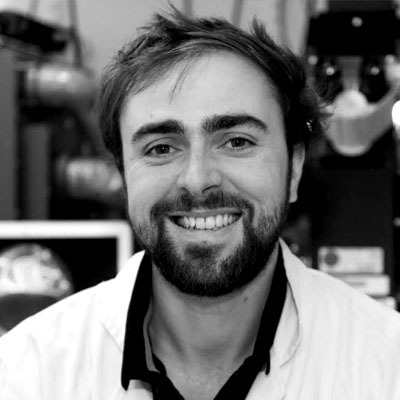 We use biophysical tools to measure the forces, high-resolution microscopy to observe the embryo deformation and genetics to perturb development. This knowledge and the techniques that we develop could have direct applications in assisted reproductive technologies. At the 32-cell stage, a cavity forms between the trophectoderm and inner cells. During this process, multiple lumens grow and eventually fuse into a single cavity. As the cavity grows, cell-cell contacts between trophectoderm and ICM cells are broken. During morphogenesis, actomyosin contractility is an essential engine of cell and tissue shape changes. Although these shape changes appear continuous, they actually are powered by pulses of contractions, which repeat periodically. Interestingly, these cyclic contractile events are conserved in evolution and can take various forms. 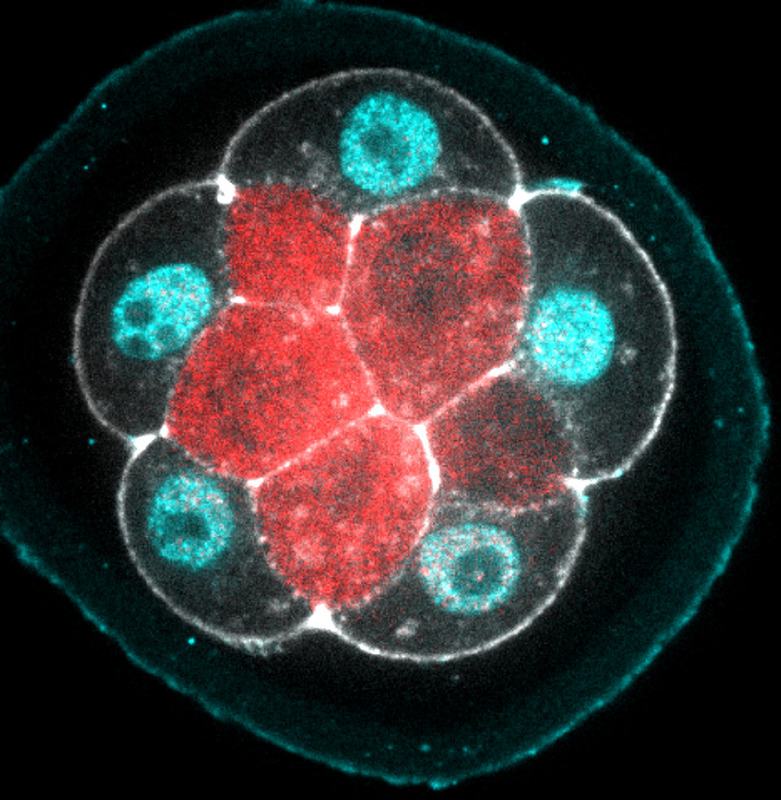 In the mouse embryo, periodic contractions begin at the 8-cell stage, at the onset of compaction.Â See Pulsatile cell-autonomous contractility drives compaction in the mouse embryo. Timelapse of periodic cortical waves of contraction (snapshot taken every 5 s). Left panel shows phase contrast, middle panel shows LifeAct-GFP and right panel shows the plasma membrane with its local curvature overlaid on top in false color. After asymmetric division, periodic cortical waves of contraction can be used to predict which cell is destined to become internalised and embryonic tissue. Indeed, extra-embryonic blastomeres remained on the surface due to their low contractility. See Asymmetric division of contractile domains couples cell positioning and fate specification. Using a dual pipette aspiration assay, elastic properties of the actomyosin cortex can be estimated in vitro. See Active elastic thin shell theory for cellular deformations.